We found one of New York's hottest spas - in LA! What a great place to spend the day with your bridesmaids! 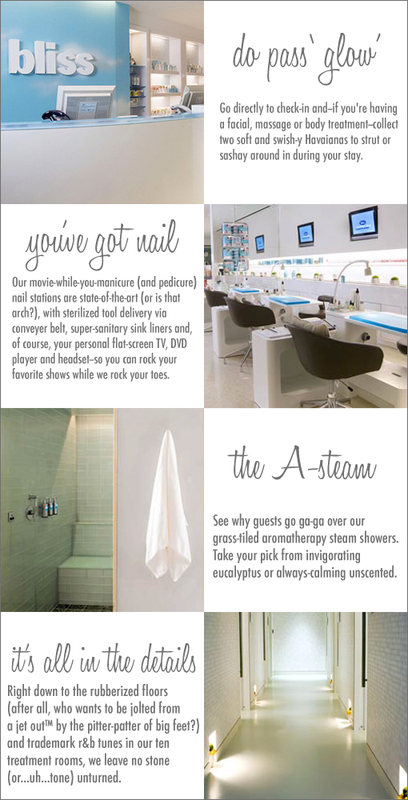 Read on to learn a little more about Bliss and what they have to say about their spa. After giving a million massages, a trillion triple oxygen treatments and about a bazillion Brazilians, we've learned a thing or twoâ€”and our passion is passing that 'glow-how' on to you.Our countless hours of spa-side tension-nixing and skin-fixing are the basis of Blissâ€”be it expert esthetician advice, cutting-edge concoctions or trailblazing treatments We've stockpiled some serious science savvy. We've been there, buffed that. We've tried and tested so you know we can be trusted. In short, we've done our 'foam-work'. (And you get to sit back and soak up the results.) Of course, behind all of this primping prowess is a dose of our trademark 'tongue-in-chic' attitude. We believe that bringing a fun, unpretentious approach to everything we 'dew' will make the Bliss experience better for you. After all, what good is grooming if you can't do it with a grin? 888.243.8825 or stop by one of our spa locations. The Wedding Chicks will definitely be making an appointment at Bliss!